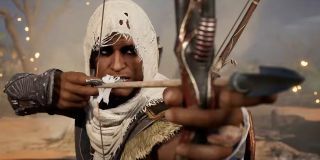 Some fans have been worrying about loot chests that have been appearing in Assassin's Creed: Origins screenshots. The chests are sold by a special merchant who sells mystery items and rare crafting materials for large chunks of gold, leading to speculation that AC:O will join the growing line of current releases that include a loot box microtransaction element. Speaking to Eurogamer, game director Ashraf Ismail clarified that these loot chests can only be purchased with in-game currency. They are designed to be a gold sink for players that successfully max out the economy. You can still acquire these high level items by infiltrating high level military locations if you prefer a more combative play style. Loot boxes are obviously an effective way for developers and publishers to eke out some extra money from players, though the extent to which they affect non-paying players' experiences varies wildly from game to game. As Andy discovered, they barely had an impact on Middle-Earth: Shadow of War. Loot boxes do trade on the addictive qualities of card packs. Read our investigation into the psychology of loot boxes for more. I'm reminded of Fifa's Ultimate Team mode, in which player packs form the basis of a parallel game that reorganises football's typical tournament and league formats into a dangerously moreish new structure. These systems have been around for a long time, but now seem to be gaining traction in genres ,like RPGs like Shadow of War, that have typically resisted microtransactions with gambling elements. I wonder if loot box money may ultimately outweigh any sales impact that comes out of the loot box backlash that is bubbling away at the moment. Do you mind loot boxes? Would the inclusion of a loot box system in a game put you off buying it?